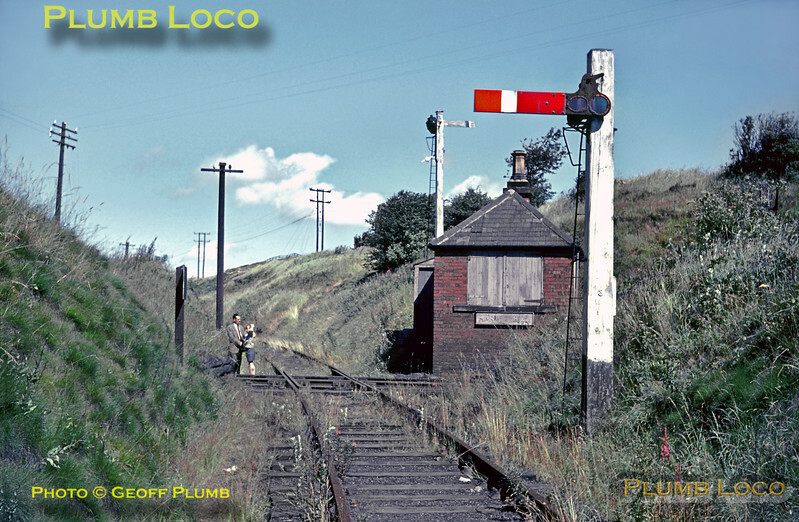 Marley Hill Crossing was the point where the Bowes Railway and the Tanfield Branch of BR crossed on the level. By this time, the BR line was out of use and quietly rusting away, while the Bowes Railway was still extant, crossing from right to left in this picture. The former signalbox and signals were no longer in use. Now, the roles are reversed as the Tanfield line has been partially re-opened as the Tanfield Railway, while the Bowes Railway has been closed. The crossing is still in place, however, and the signalbox is back in use. The Tanfield line in the foreground is back in use while the former Bowes line is used merely as a headshunt from Marley Hill shed, the cutting to the right of this picture having been filled in to form a car park after a few yards. Thursday 5th August 1965. My father Derek and youngest brother Keith stand by the crossing. Slide No. 1571.